(IMECE). The week long event hosts hundreds of engineers from all types of backgrounds. IMECE is the largest interdisciplinary mechanical engineering conference in the World. As so, it plays a significant role in stimulating innovation from basic discovery to translational application. It fosters new collaborations that engage stakeholders and partners not only from academia, but also from national laboratories, industry, research settings, and funding bodies. It was a sunny, balmy November weekend in Florida, but it wasn’t an escape from the rain and the cold that brought a group of four NC State MAE undergrads to Tampa the weekend of the 3rd. The American Society of Mechanical Engineers kicked off its annual International Mechanical Engineering Congress and Exposition on Friday, and among the starting events was the Student Design Competition. recalled co-design team lead Cory Hall about his first impressions of this year’s design challenge, which was to build a robot which could complete five disparate tasks in a “Robot Pentathlon,” including a tennis ball launch and a stair climbing event. 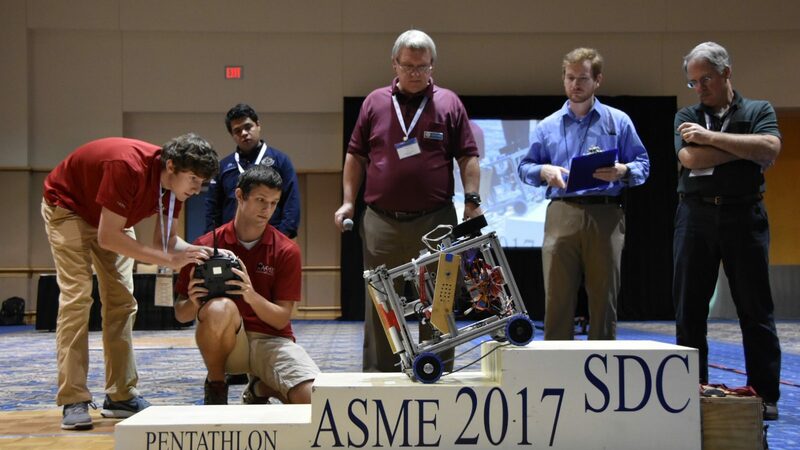 The NC State team competed in the regional competition in Tennessee earlier this year before continuing to the internationals, where they drove the robot to secure fifth place, an achievement the students are proud of. Each year, the competition proves an invaluable practical learning experience for MAE students: “the competition reinforced the importance of simplicity and repeatability in engineering. We saw robots, including our own, that had been proven in competition fail due to complexity and unforeseen complications,” observed team member Matt Bower. Most importantly, everyone had a good time – between late-night design sessions in the hotel room and stopping by a local dessert bar for ice cream and cookie dough, the trip is one that the students certainly won’t soon forget.